This season -- his first in the Big Ten -- will be a big test for Gophers coach Richard Pitino. MINNEAPOLIS — First-year Gophers coach Richard Pitino didn’t have a say in his team’s schedule. He merely inherited it when he took over the program this past April. Yet even though Pitino’s squad finished its nonconference slate with games against the likes of Nebraska-Omaha and Texas A&M-Corpus Christi, Pitino still believes his team is ready for Big Ten play. He cites the Gophers’ loss to Syracuse — currently ranked No. 2 in the nation — in the Maui Invitational as something his team can learn from. Pitino also knows he can draw on the positives from a road win against Richmond. But playing teams like Coastal Carolina or Wofford taught the Gophers something else that will come in handy in the Big Ten: you can never take a night off in college basketball. "It’s tough sometimes to get up for every single opponent," Pitino said Saturday after his team closed out the nonconference season with a win over TAMUCC. "I think our guys, if you look back over the last 13 games, they didn’t lay an egg mentally, which you see a lot in college basketball. We’ve kind of closed that chapter and we move from it and we move onto the Big Ten." Minnesota closed out its nonconference schedule with an 11-2 record. The two losses came in Maui, when the Gophers dropped back-to-back games to Syracuse and Arkansas. Minnesota hung close with the Orange in the tournament opener in Maui and fell apart in the second half en route to a loss to the Razorbacks. Since then, the Gophers have rattled off six straight wins. There haven’t been many big games yet on Minnesota’s schedule, as the Gophers only faced one ranked team in the nonconference portion of the season. Even so, Pitino has made sure his players haven’t looked too far ahead. That included this past weekend as Minnesota still had to take care of business against Corpus Christi before preparing to face Michigan this coming Thursday. Pitino admitted he hadn’t watched any film of the Big Ten — or of the Wolverines — yet, waiting until after Saturday’s game to do so. That mentality has rubbed off on his players. "He tells us to look at the bigger picture," senior Austin Hollins said of Pitino. "It’s more than just winning the game. It’s getting better as a team. Winning isn’t enough. The score’s 0-0 each possession and we try to go out there and get a stop. That’s our main thing, just stay focused for 40 minutes and trying to go out there and play like it’s our last game." Pitino, of course, has never coached in the Big Ten. 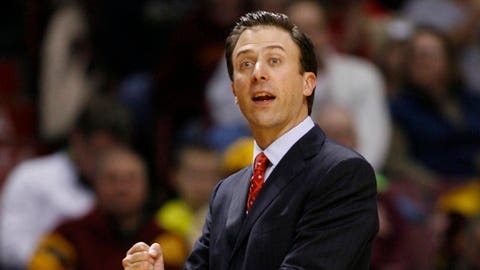 He had just one previous year of head coaching experience at Florida International before taking the job at Minnesota, although he did serve as an assistant at top programs Louisville (under his father) and Florida. Several of the Gophers’ key contributors — transfers DeAndre Mathieu, Joey King and Malik Smith — have also never played a second of Big Ten basketball. Yet after Saturday’s win, none of Minnesota’s players seemed concerned about how well their nonconference schedule did or didn’t prepare them for the rigors of the Big Ten. "Coach gets us fired up. We get ourselves fired up," said Mathieu, who averaged 11.5 points and a team-high 4.8 assists through his first 13 games with the Gophers. "We know that we can’t take any days off because anybody can beat anybody on any given day. . . . A tougher schedule would have been cool, but it doesn’t matter." 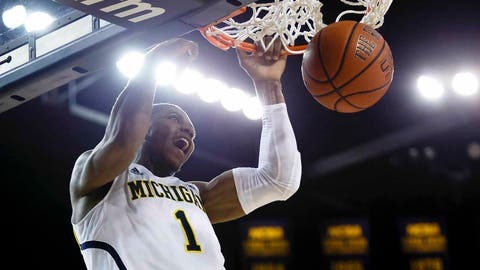 One of the big questions that remains to be answered is whether Minnesota can use a four-guard system in the Big Ten, a conference that rarely sees four-guard sets. It worked at times against undersized nonconference foes, but the Gophers’ frontcourt will need to step things up against the Big Ten’s bigs. If there’s one thing that’s not lacking for Minnesota heading into this week’s Big Ten opener, it’s confidence. Not many people gave the Gophers a chance to compete in the conference this year, with expectations ranging from the middle of the pack to near the bottom. Yet they’ve tuned out those outside opinions and intend to prove people wrong. As far as Pitino’s expectations, he insists he didn’t have many in terms of where his team might finish. He didn’t have a set number of games he hoped to win or a place in the Big Ten standings he wanted to finish. Instead, the goal was just to improve every day in his first year at the helm. "You’re almost on a one-day plan. You’re just trying to get the most out of these kids each day, and they’ve absolutely exceeded that when it comes to their attitude," Pitino said. "We’ve got great kids. Again, 99 percent of the time when they’ve stepped on the court, they’ve tried to get better. Year one, those are my expectations, so they’ve probably exceeded that."